Some good Irish wakes are always scheduled this time of year around the Garden State. They go off like clockwork. The service planned six months in advance is almost always better than one on two days’ notice. It’s the difference between life and death, laughs and mourning. 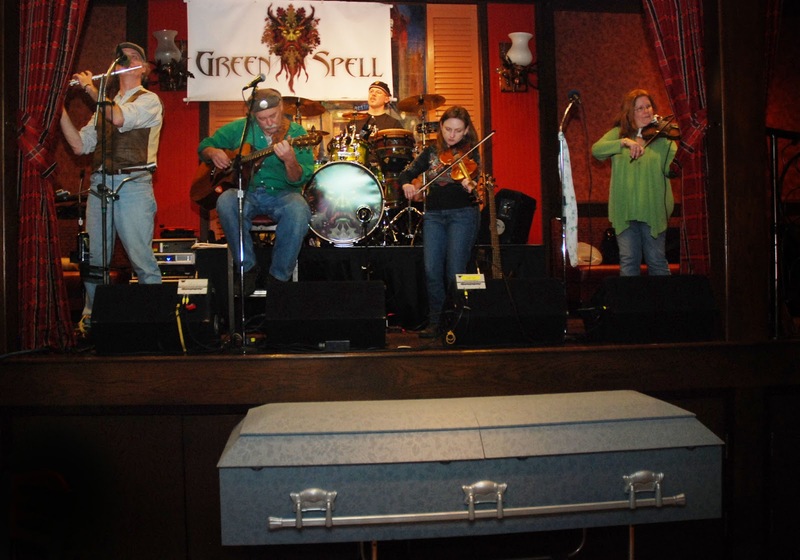 Some well-planned fundraiser wakes are peaceful affairs featuring an empty casket as nothing more than a prop for the band. In other bars and halls, the funeral box of crude wood painted a sickening bright green holds some poor, still-breathing volunteer braving big splashes of ice cubes to the face and the coffin-banging of mock mourners dressed for mardi gras as the Irish street ballad “Finnegan’s Wake” is sung. Either way, the funeral parties benefit St. Patrick’s parades and the craic is mighty. A few Sundays back, Honey Badger and I hit the road to the Shore for the first wake of the season. The “funeral home” for the event was Hemingway’s bar and restaurant in Seaside Heights. The gathering was a fundraiser for the Ocean County St. Patrick’s Day Parade. We headed down to show our support for the storm-battered county headstrong enough to carry on with their annual St. Patrick’s celebration despite the destruction of Sandy Storm and the struggles of recovery. Honey Badger wheeled her truck to Rt. 35 in Brielle for the slow, painful drive down the ocean road. The devastation of Sandy Storm showed itself as we crawled through Bay Head and Mantoloking, down to Lavallette and Ortley Beach. More than three months after the hurricane struck, homes lay wrecked as if the storm was the day before. No house, big or small, was spared damage. Some are no longer there. Some are cut in half as if a massive saw targeted their middle. Some you can see straight through to the ocean sky behind them. Some are a pile of rubble between a foundation and a roof. The drive was through a seemingly endless beach cemetery, with us silently hoping and praying for resurrection. The Jersey Shore is always a bit quiet in winter. But the northern barrier island held an eerie stillness of a graveyard. Shops were closed and few souls were about. Broken houses stood like headstones. In Seaside, we finally found a bit of life and hope. A few storefront lights shown and plenty of the faithful were inside the bar for the good wake. The first one we ran into was Young Bernie Mackle. Granted he is older than myself, and neither of us are that young anymore, but I will always think of him as Young Bernie because of his father. The late, great elder Bernard Mackle was my father’s best friend and quite a man. He was Boston Irish and a Pearl Harbor veteran. He was a civil engineer who raised a brilliant Irish family at the Jersey Shore. He was a proud, smart American and an unquiet Irish Republican. Bernie Mackle was also famous for his “England Get of Ireland” banner that he and his friends would carry in parades from New York to Dublin for much of the 1970s and 80s. As a lad, I spent many a weekend each March keeping a tight grip on that green banner as we hoofed it through parade after parade. It was good to see the Mackles, and of course they are still involved with all things Irish. And the Ocean County parade crew hosted a fine party with a few pleasant surprises. First, Hemingway’s isn’t an Irish pub and offered their full menu. It was the first St. Patrick’s event we ever attended where we could order sushi instead of corned beef. Then there was hearing fresh Irish music by a band we knew nothing of. Fresh to us, that is. They are called Green Spell and hail from down Cape May way. What a fine sound, and with two fiddles! Give them a search and a listen. The pipers and drummers were also dead on. The Shamrock and Thistle Pipes and Drums of Ocean County gave the crowd a powerful performance including an arrangement of “Amazing Grace” we’d never heard before. Honey Badger, a piper herself, enjoyed and was impressed. So the bands and the people are ready as this coming weekend kicks off the St. Patrick’s Marching Season in the Garden State. Down the Shore it begins with the Belmar & Lake Como parade on Sunday, March 3. Step off is at 12:30 p.m. The following Saturday, March 9, the Ocean County St. Patrick’s Parade pours down the main drag in Seaside Heights starting at 12 noon. These towns and their people need our support as they keep working away at recovering from the devastation of Sandy. Helping them celebrate St. Patrick is a fine way to start. Leaving the wake at Hemingway’s, Honey Badger and I snuck up to where the Seaside boardwalk use to be, where the beach now meets the street. The sight was shocking but nothing that can’t be sorted out in time. No need for a wake for the Jersey Shore.